Crowhurst parish lies in the attractive and rolling well-wooded countryside of the High Weald, extending across the Combe Haven Valley to the north-west of St Leonards and Hastings in East Sussex. Based upon our own field surveys and desktop review of county and district-wide studies, we prepared a Parish Landscape Character Assessment (incorporating a Parish Landscape Character Plan) to help inform and provide robust landscape evidence for the Crowhurst Neighbourhood Plan. Our work also included appraisal of four selected sites to help inform and support a ‘preferred option’ for future residential development in the parish. 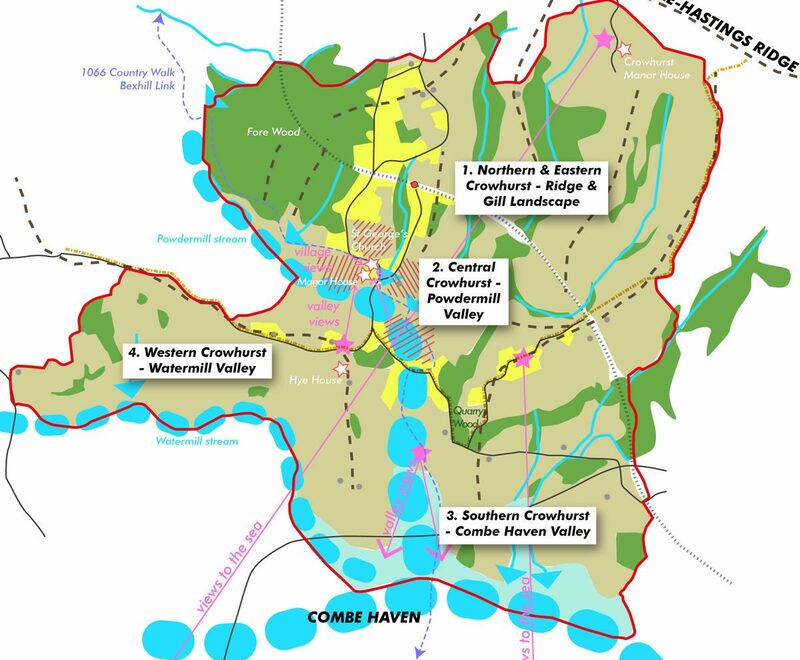 Four sites were assessed in terms of their landscape sensitivity and capacity for residential development and concept landscape strategy diagrams prepared to guide appropriate future development and management of the landscape. These included general and site-specific design guidance on how development could be accommodated to achieve landscape and visual integration and mitigation and ensure that attractive in-character places are created.